Family, The 2 Pictures above were taken by Ramoma Brown. 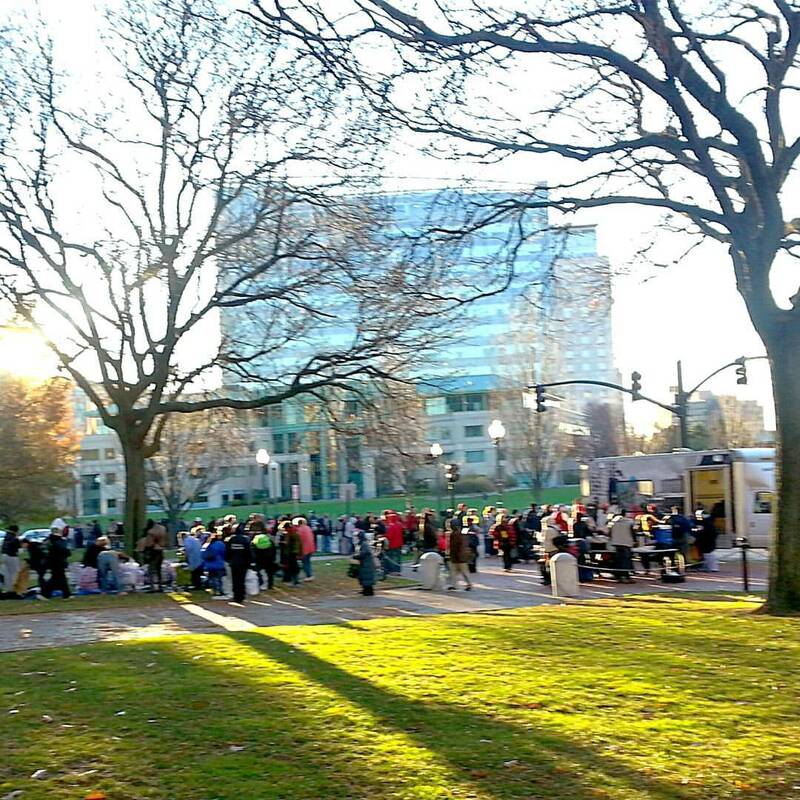 The Rhode Island Dream Center, Hope for the Homeless Back Pack give away on the State House Lawn This Saturday Morning that all of You made possible. 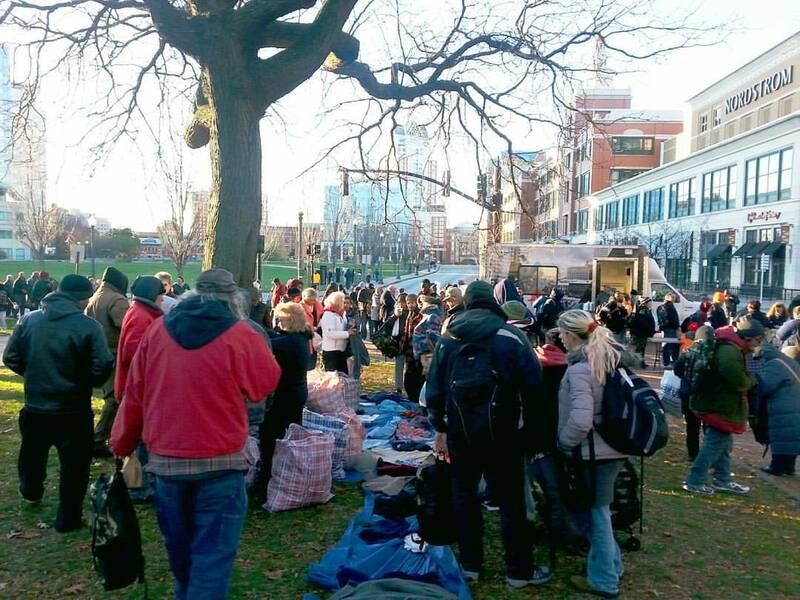 Around 350 or more Back Packs were given out, Along With over 35 Huge bags of clothing and Lunches and Coffee, That all of you so generously donated. Once again you have blessed hundreds of lives as you continue to do so each and every week, these are the people you serve. The very same people you serve At Kennedy Plaza and Crossroads each week. They once again were in awe and so very thankful. You make it Happen! God bless you all. It brings tears of great joy to your eyes to see how thankful and blessed, They are and that God has blessed us all with a family that serves together in unity, with loving giving hearts and so many giving out of their very own need. 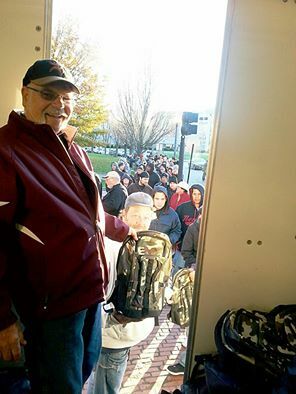 See Chuck passing out the back packs and the long line of Hundreds of people in Picture below. Thanks for capturing these pictures Ramona. Thank you Andrea Smith and Romona Brown for helping us pass out all the clothing out. Thank you to Chuck Johnson and all those who loaded the truck with Back Packs and all the clothing bags. Thank you to George Stockwell for making the coffee. Thanks to all those who donated there time and served in any way. God bless you all. What a huge Blessing !!!!!!!!!! great needs: warm winter gloves Gloves Men’s Jeans size 32 to 44 and one mansize 50 ,Sweat shirts sweat pants, Hoodies ,jackets ,socks, Clean ,warm winter clothing ! All the men are asking for pants!!!!! Thank you’s were so many and so genuine, And one Young Man Made the sign of the cross and pounded on his heart and blew kisses and a blessing of the cross and said thank you all so much Angels!! for the coat and socks we gave him. Another man Put on a coat we gave him and he said with the biggest smile on his face look at me in this awesome coat it fits me just right and it is so warm thanks with all my heart, this is so perfect for me. June Is having tests to see if there is a tumor in her spine, She keeps loosing more and more weight, she goes to live it up service each week. Hilda Healing miracle of her aorta and spot on her lung, and her and all her family and friends battling cancer. All those struggling with addictions especially during the holidays which is a very hard time for them. Scott Said The Convention Center feeds 1,000.00 People the Saturday before Christmas Puts on an awesome dinner between 11:30 and 4:30 and Between 10 and 11 am people line up for the coats they give away and he said they also give Back Packs loaded with stuff. So many people helped out to make this such a success. This is much more work than just the last few months before the Give Away. Without the folks who helped raise the money through the Motorcycle Run, The Craft Fair, The Bake Sale and the Company Donations and Grants that were solicited, the large donations of Food and Time form Volunteers, this would never be possible!!! It is a year long effort and lots of hours put in that can never be repaid to these people who no one sees. They do it without recognition nor paychecks of any kind. They do it for the Lord and the Lord’s People. They do not look for thanks, just the great blessings of God as we reap what we sow!! Stan WinmanRamona BrownCarol BrownCarol CapuanoToni MorseKrystal SmithTommy King JrLinda CantoneJoe CantoneSharon CogeanThe Food Truck Folks: John, Ed, Richard, Dave, Ramona, and all the names I don’t knowClaudiaLeoThe LIU Homeless Committee — YEA for these guys! !AndyEd BradyGilannie PangburnJune PangburnAND SO MANY OTHERS!!! I am sorry if I forgot your names!!! Well said, and great job Artie!